Some time ago, a random post on Facebook got me looking at an area of Northern Michigan (Upper Peninsula) near a small abandoned town of Corinne in Mackinac County, Michigan. If you cannot find Corinne, look for Gould City and follow the railroad tracks West a couple miles to where they cross Corinne Road. You may also find it listed as Viola since that is the original name. For some reason the post office and railway station were named Corinne instead and the name stuck. The post had three images from the area of Corinne. These are taken from family photos who lived in the area. The person who provided these images still lives in the area today. They are all assumed to be and around Corinne. The images are shown below with captions of what was known. Each photo has railroad elements in it. Corrine today is a ghost town. Many buildings have been lost and only the foundations remain. They are clearly visible in the google satellite view. The railroad is the former Minneapolis, St. Paul and Sault Ste. Marie Railroad or SOO Line as it became known. Fisher Family 1915 with Line House in the background. The house was relocated to the opposite side of the tracks at a later date. Heinz Family 1916. There appears to be a 0-6-0 pushing cars in the background. Notice the wagons in the street and by the pole. Are these newspaper boys? Anyone have any idea what kind of vehicle that is? These are excellent images capturing a moment in time with the railroad. Upon comparing the photos with each other and to satellite images and Google Street view, a few curiosities appeared. Corinne Michigan. We can also see that by 1915 things are pretty sparse. There are not many buildings. A close look at the satellite view does show that most buildings appeared to be on the North side of the tracks which is out of view in the photo. 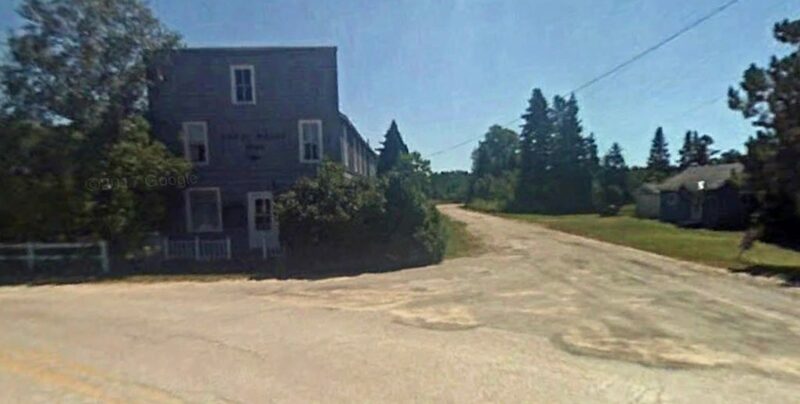 This street view Corinne Michigan today shows the long building, from the Fisher family photo, is still standing. The Line House could not be located and assumed removed. Large trees and overgrowth would not allow an image from the same perspective as the original photo. The second image starts the mystery. At first I thought the long building was the same as the one in the first image, but that can’t be. It is single story all the way to the front. The other building was two stories. Although the angle makes it difficult to tell, the locomotive (hence tracks) appear much closer to the building than in the first photo. So what is the location of this photo? 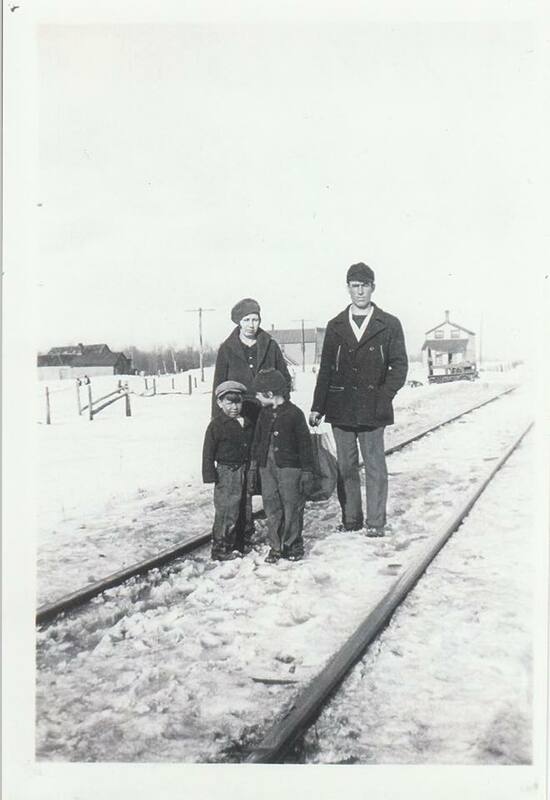 Being a family photo, it should be from the area and the tracks put it in a limited number of locations along the SOO Line. The building behind the locomotive has a very odd shaped roof line. This could be a coal shed or other utility structure. We need to ask the question is the locomotive in this photo a SOO Line? Although we can only see the very front of the locomotive we can make out that there is not a front wheel set making this a switcher (very likely a 0-6-0). 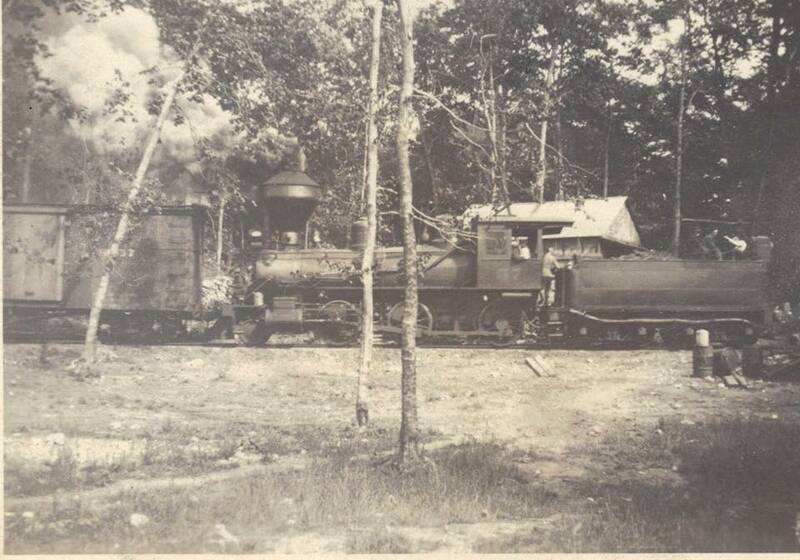 Early Soo Line 0-6-0 from around 1890-1900. Note the locomotive number on the steam dome and the older style oil headlamp. When comparing this locomotive to known SOO Line locomotives some equipment looks right while others not so much. The headlamp is different but it does fit the style and location later electric lamps which could have been installed by 1915. 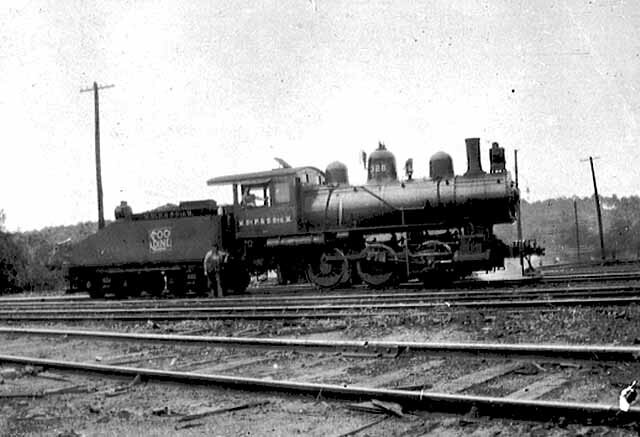 The number boards on the headlamp appear to be missing but the SOO Line in its early days did not put them there and stenciled the number on the steam dome instead. Unfortunately the steam dome is hidden from us. The lettering on the cab is just too blurry to be sure what that says. 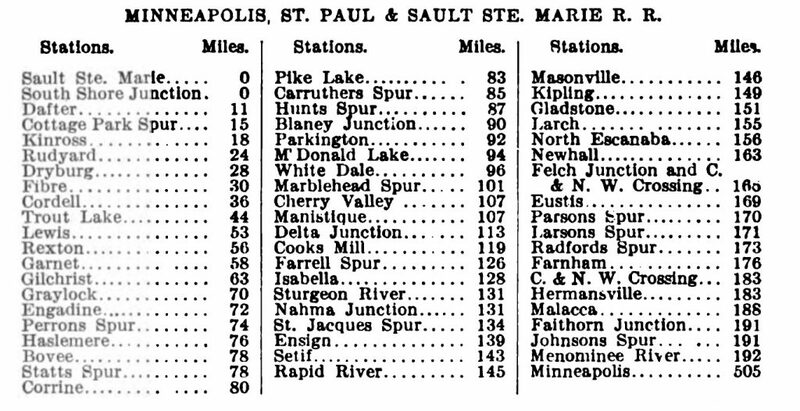 All 0-6-0 for the SOO Line were numbered in the 200 and 300 ranges. Since this locomotive is a switcher it was most likely stationed nearby and performed its duties at a number of industries. Gould City and Corinne were lumber towns. That means saw mills, logging, and many side industries were operating in this area. This locomotive may have been the shop goat for one of these mills. A station listing from 1909 shows stations on either side of Gould City and Corinne were Statts Spur and Carruthers Spur. A name with “Spur” indicates to me incoming traffic and possible links with heavier industry. The third photo creates additional mystery. 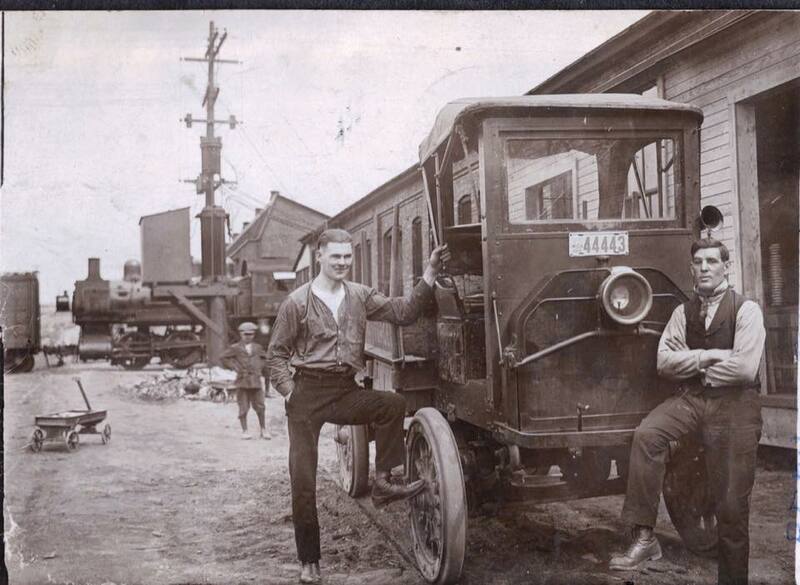 Here we have a clear photo of a very old 2-6-0 locomotive pushing/pulling cars on a siding. 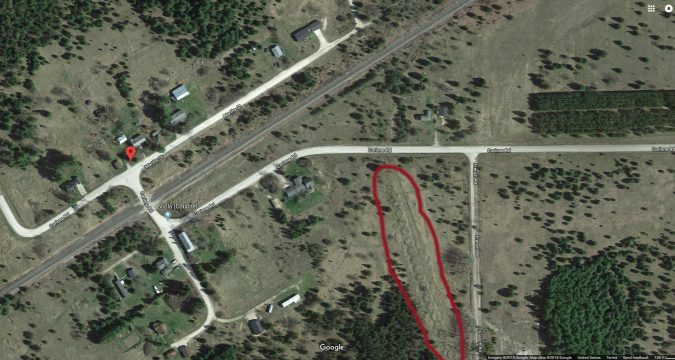 The provider believes it was Hunt’s Spur which was a stop on the SOO Line seven miles West of Corrine. Here we can see the locomotive number is two digits and appears to be 57. The problem with this is the best SOO Line Steam roster I can find shows all 2-6-0 were in the 100-200 number range. Also, I can not find any evidence of the SOO Line ever owning a wood burner. The key here is never say never! While doing research on this locomotive I did turn up other SOO Line locomotives that did not match any roster I could find. This area was also a logging area and this could have been a logging locomotive exchanging supply cars with the SOO Line. The last mystery has to do with what I found on the satellite images when I looked at the area around Corinne. Clearly visible are a number of circles which appear to be next to an abandoned roadbed diverging from the current railroad. A long sting of circles indicates that coke ovens were in operation here at one time. A sign that heavy industry was nearby. The line of circles is the remnants of beehive coke ovens. Coke is used to fire furnaces for heavy industries or steam boiler plants. This is a direct indicator that some heavy industries were in operation in and around this area. Since the primary business in the late 1800 and early 1900s was logging, the coke from these ovens was mostly likely used for furnaces to create steam to run machinery in the mills. Researching historical images and locations is a part of the hobby that I enjoy. To look at the details of these images and put together the parts of a forgotten time is great fun to me. By the way, did you see the paper boy wagons in the photo? Can you find the remnants of the horse track in any of the satellite images? Unless there were coal mines nearby as this was a logging area the ovens might have been for charcoal rather than coke ovens. There are several remnsnts of charcoal ovens in eastern Nevada – ironically the trees have never recovered. Good point and very true!! As you can see from the photos, trees are here but not nearly as dense as they once were. looks more prairie than northern forest region. I like your researching Marshall (easier than actually working on the layout, eh….LOL) I enjoy the researching as well, and sometimes more than the actual working on the model. But it’s all good, so interesting and informative. About that beautiful truck! I do not know what kind it is, and I have literally hundreds of research photos of such trucks. I do believe that it has an internal combustion engine, by the presence of a hand crank, and that big radiator. There were a lot of electric trucks back then, but likely in the bigger cities, port cities, as their range wasn’t much more than 35 miles. The single rear wheel makes me think it’s not a heavy/high tonnage truck, and if that fellow in the center would move, we could be sure if it has chain drive or not- but I don’t think it does because I don’t see any evidence of a big sprocket on the rear wheel. Surprisingly, a lot of the old trucks like this, did not have windshields or roofs, at least not from the truck manufacturers themselves, and there were a LOT of small, short-lived truck manufacturers back then as well. All to say that this one could be very hard to identify, since nothing is clearly visible on the radiator (behind that cool headlight) or on the side panel directly under the seat. The early GMCs which started as RELIANCE usually had the GMC on that panel. Perhaps someone on TheOldMotor.com could be of help. The trucks back then did seem to each have their own distinct radiator shape, which I can’t match up with any of my photos at the moment, but it does help eliminate certain truck manufacturers, like Packard, Brockway, etc. Also, keep in mind, when dating these photos, that the dates on them may not be “accurate”, or the date of the equipment pictured. The family may not have developed the film until well after the pictures were taken, and hopefully dated them correctly. The truck could very well be a 1905-1915 model also, but it could also be fairly new and someone was proud of their new truck. Not saying that the people who originally posted the photos are wrong at all, just that unless there is irrefutable evidence in the photograph itself and/or written on the back, we’re always making an educated guess. What is so very nice about the old b&w photos is that more often than not, the resolution of them is incredible, and details can be seen clearly when you zoom in on them.